Your most memorable Valentine’s Day yet is waiting on the water, when you and your sweetheart join us aboard Spirit of Washington for dinner! Take in the city skyline in Washington DC on an all-you-can-eat buffet cruise. 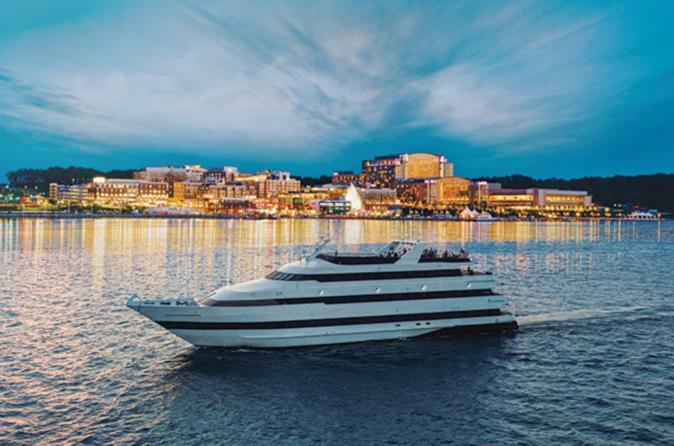 Board a luxury boat for a sightseeing cruise on the Potomac River with dinner and dancing while a DJ spins your favorite tunes. Pass by illuminated landmarks such as the Washington Monument and feast on a variety of delicious dishes during the 3-hour tour. Meet for this 3-hour cruise at Washington DC's Pier 4 to experience the perfect celebration of love. Boarding the cruise ship starts at 6pm., and the boat takes off at about 7pm. There are three package options to choose from for this cruise (prices vary). During your dinner cruise, enjoy the Washington DC views from one of the five decks on your luxury cruise boat. Be sure to bring your camera to capture not-to-be-missed views of DC landmarks while your captain journeys down the Potomac River. Enjoy a relaxing evening of sightseeing, fine dining, and dancing. Fill your plate full of sumptuous dishes from the all-you-can-eat buffet and take a seat in the elegant dining room while the DJ entertains with dance tunes and comedy. After dinner, spin your partner around the dance floor as the DJ plays your favorite songs, or take a romantic stroll around the ship’s decks and soak up the illuminated DC landmarks, including the Washington Monument, the Woodrow Wilson Bridge, and the Admiral’s Row colonial town homes. At the end of your 3-hour cruise your ship docks back at Pier 4 at around 10pm.